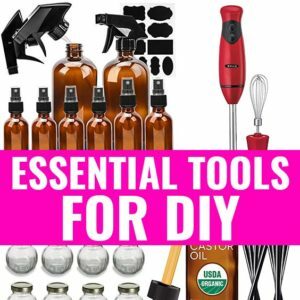 Coconut Oil and Baking Soda for Wrinkles - beautymunsta - free natural beauty hacks and more! Do you want to look 10 years younger?! Try using coconut oil and baking soda for wrinkles 3 times a week! Coconut oil and baking soda are both amazing anti-aging ingredients. 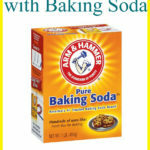 Baking soda helps with cleansing skin, gentle exfoliation, shrinking large pores and firming the face. Coconut oil, on the other hand, is intensely moisturizing, nourishes skin cells, has antibacterial properties and reduces fine lines on the face. When combined, coconut oil and baking soda instantly nourish skin cells, remove dead cells, moisturize skin and keep it smooth and silky! You’ll be surprised to see your fine lines looking non-existent too! With regular and consistent use, be prepared to look 10 years younger with coconut oil and baking soda! 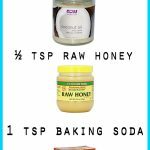 Here’s my coconut oil and baking soda facial mask that I LOVE so much! 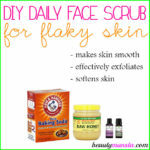 I like storing my batch and using it 3-4 times a week for luscious skin! Into your glass jar, add ¼ cup creamy coconut oil. Now pour in 3 tbsp of baking soda. Mix the two ingredients thoroughly using a spoon till well combined. Finally, add 2 drops of lavender essential oil and 2 drops of tea tree essential oil and stir again. Store your jar in the bathroom cabinet. To use, scoop out about a tsp using dry fingers and massage it gently all over your face, avoiding the eye area. Leave it to do its magic for 7 minutes then come back and rinse off with tepid water. 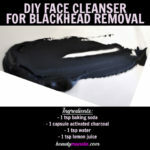 Use a Green Tea Toner as a natural facial toner and while your face is still damp, massage this Powerful Anti-Aging Serum for moisturization and wrinkle-smoothing effects! Protect Your Skin With Anti-Aging Coconut Oil SPF Moisturizer Now! 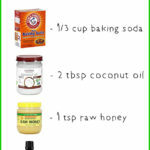 Please try using coconut oil and baking soda for wrinkles – you’ll be astounded by the results!